Saturday, October 21st (2017) is the next Saturday Swing dance in Tampa, with Dancing 9pm-12. Join us at 8pm, prior to the dancing, for the Swing Dance Lesson. Admission is $10 and parking is free. All ages are welcome, no partners are needed, and prizes are given away at intermission. Doors open 7:45pm. Saturday Swing is a monthly event in Tampa Bay where dancers gather to dance and practice all forms of swing-era dancing, including Lindy Hop, Balboa, Collegiate Shag, St. Louis Shag, Charleston, Foxtrot, and East-Coast Swing. 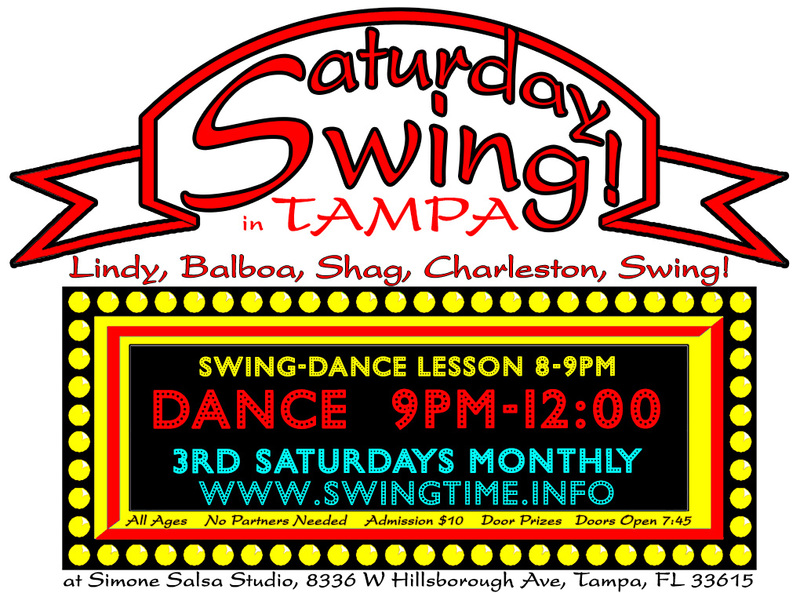 Saturday Swing happens the 3rd Saturday of every month at Simone Salsa studio, 8336 W. Hillsborough Ave., Tampa, FL 33615. Simone Salsa's studio on Hillsborough Avenue features awesome atmosphere, lighting, sound, and a large smooth hardwood dance floor! Address — It's located in the Home Design Plaza shopping center at 8336 W. Hillsborough Ave., Tampa, FL 33615. Parking — Simone Salsa has a big (and free) parking lot just a few feet from its entrance. Drinks — You can BYO beverages to this venue. Bottled water and soft drinks are also available for purchase; they're in the kitchen's cooler; just drop a dollar per drink in the fishbowl.